Bob Perry designed Royal Passport 49, Taiwan built, rarely available in Australia, has over 30,000 blue water miles to her credit. She is a classy boat designed to be easily handled by a couple and her solid dodger provides bridgedeck comfort, security and weather protection at sea and at anchor as the covers enclose the cockpit for wet or cold climate living. All furling sails makes for safe and comfortable cruising as well. 4 solar panels on the solid dodger provide ample power for electrical needs. Life aboard is very comfortable at anchor in the spacious owner's ensuite stateroom aft, fully equipped galley to starboard with dedicated nav station to port, seating for eight in the saloon and ensuite king size guest V- berth forward. Quality construction solid teak fit out. At sea, with all furling sails controlled from the cockpit, her owners have enjoyed sailing her shorthanded a sthey say it is safe and easy. Recently hauled out and antifouled in 2018 she is ready to take you on your Cruising Dream. Cavalier 45 buyers should consider this fabulous vessel ! Teak interior, with teal macro suede cushioning throughout in excellent condition. 6ft 6in headroom throughout. Master cabin aft has queen bed with custom built mattress and ensuite heads with separate shower. Full length hanging wardrobe and half length robe with shelving and many drawers and storage lockers. Large forepeak cabin has hanging robe, drawers, storage lockers and ensuite shower. Main saloon has wrap around setee which can convert to an additional 2 single berths. Cocktail cabinet to port and built in cabinet to starboard housing flat screen TV with DVD player. Teak dining table folds to cocktail size and can be raised/lowered/swiveled. Lots of stowage. A separate workroom also provides ample space for tool storage and projects. * 1 x Furuno Radar 1835 104"
Experienced sailors will immmediately recognise one of the attractions of True Blue 1 is her solid dodger which was custom built by NZ boatbuilding craftsmen at a cost of $50k. It's rugged construction has endured all sailing conditions on her South Pacific and World voyaging. Having had only 3 fastidious owners, True Blue 1 has always been subject to a program of continuous maintenance and upgrades. She has also recently been antifouled - June 2018. 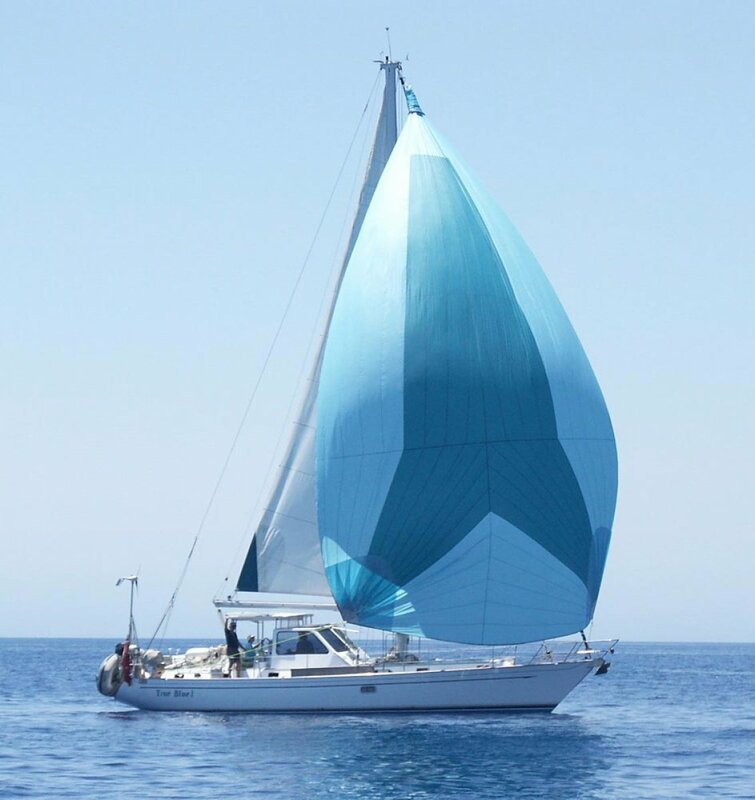 Having completed a leisurely 10 year circumnavigation with her previous owner a few years ago, and maintained to a high standard by her present owners, she is realistically priced to sell and is ready to take you on your cruising dream. Phone (07) 5502 3124. Celine Flamain 0429 867 913 or Ian Mackenzie 0419 756 540 Email sales@mackenzieboating. Com. Au for more information on this vessel.